Last week Max and Savannah had their last ever playtime and Max went on to live in his forever home with one of our Cincinnati Zoo keepers. Many zoo media followers asked questions about why the separation occurred and if Savanna and Max would miss each other. Max came to us from the Miami County Animal Shelter in 2012 to be a companion for Savanna since she did not have a sibling to run and play with. You can see their first meeting here (http://www.youtube.com/watch?v=cUwzxVu6n08) He has been a great companion animal for her but we find that as our cheetahs grow up they no longer need their companion dog. In the wild, cheetahs are solitary once they leave their mothers at about 2 years old. The only exception to this is if a cheetah has a brother of the same litter, they will stay together their whole life and be a coalition. This is why we can house Bravo and Chance in an exhibit together. 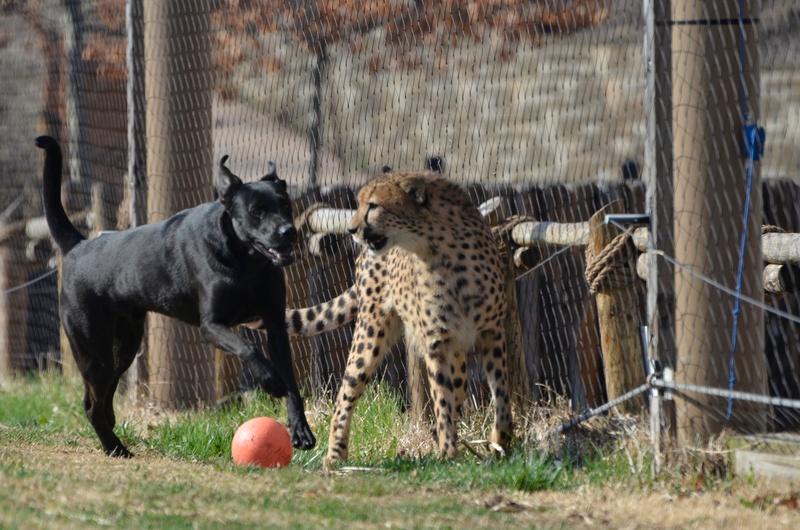 Some zoos do keep their cheetah and dog pairs together for life but at cincinnati we find that while the cheetah and dog would be cordial buddies they don’t need the companionship as they did when they were young. So we choose to separate the dog and cheetah and let the cheetah have their own space and the dog have their own life. 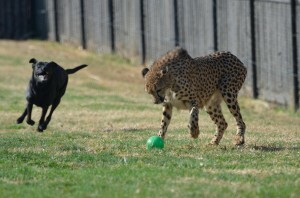 Max and savanna are our fourth cheetah/dog pair that we have reared at the zoo. If you want to learn more about why and how we use companion dogs you can look at the last cheetahdays blog here. 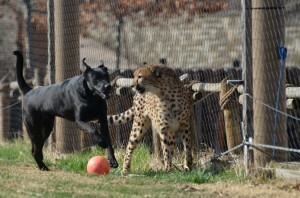 Will the cheetah miss the dog? We don’t think they will. We are careful to start the separation process when the cheetah is ready. Savanna is the one that has decided that Max is fun but she wants her room now. When she was young she would chirp for him when he was out on a walk or hanging out with the other zoo pups but she does not so that anymore. This lets us know that while she had fun when they get to run and play, she no longer needs his companionship. She is a confident and content female cheetah that no longer needs her childhood companion. Though it’s sad for us to think of that we must remember that animals develop differently from us and while some are social others live solitary lives. Having their own space makes them happy and our goal at the zoo is always to make sure our animals are the healthiest and happiest possible. Have you noticed the bald spot on polar bear Berit’s belly?